Let me start by apologizing that no, it wasn’t a bike move. Also, you’re not the first to ask ;) I used a PODS (Portable On Demand Storage) portable storage container. 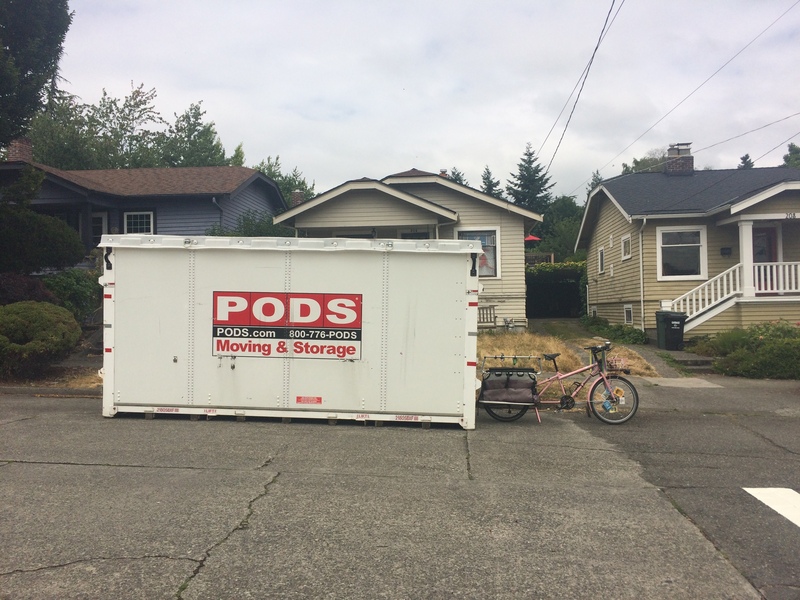 There are many brands of movable storage containers, some that operate only in certain regions, and I’m pleased to report I found my PODS very convenient. Choosing arbitrary dates for the container when booking it was the hardest part, but it ended up working out just fine. I had the container at our house for a week and gradually carried all our stuff into it…alone, because I was too stubborn to ask for help, which I don’t recommend. At one point while collapsing under the king mattress in the basement stairwell for the third time I muttered, “I wish there were two of me!” so do consider using a movable storage container, but also consider enlisting help. Then we camped out in sleeping bags for a week because that’s how long it takes the PODS to make its journey. I traveled down solo by train to meet the PODS and unload (with help for the few big items this time–I learned my lesson) in just a day. I used the largest of the three container sizes (16 feet, holds 3-4 rooms worth of stuff). Fortunately, my many recent forays to the thrift store to give away years and years of accumulated needless stuff paid off and I was able to fit just about all of our belongings into the one container. I originally booked two, with the smallest of three sizes (7 feet, holds one room worth of stuff) to arrive right after the big one was picked up, but it was easy to cancel the second container as soon I could tell everything would fit in the first PODS. While I thought I had put just about everything in the PODS it turns out those “just a few essentials” left out to use during the moving process somehow expanded. 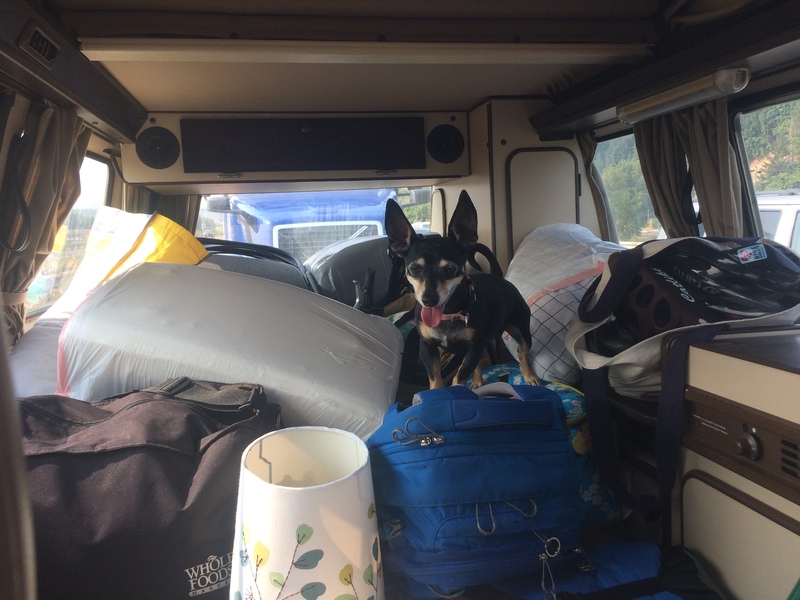 In addition to my train trip down to meet the PODS, I also took a trip down with my friend Michelle in her Westfalia camper van packed with quite a lot of leftover stuff. One of the hardest things was deciding which bike to leave out. 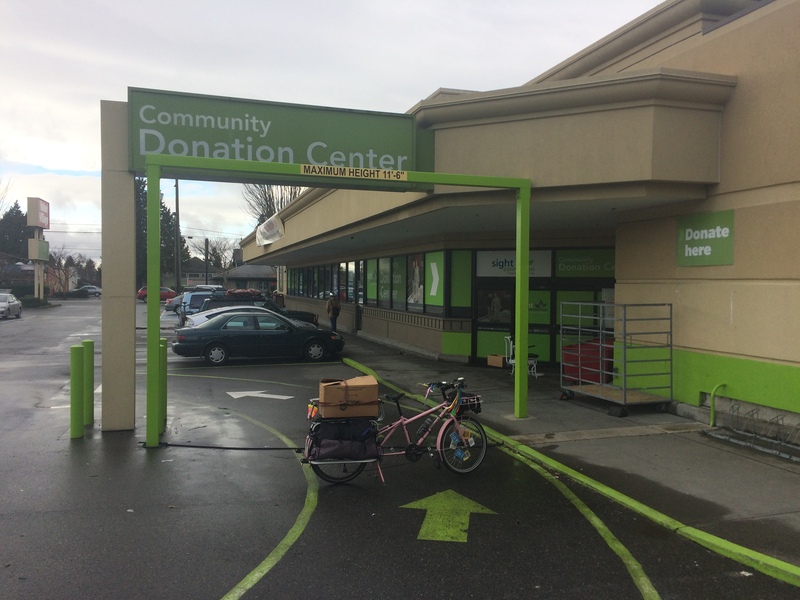 I wanted to get everything except for my new Brompton folding bike in, but I ended up not being able to fit my Surly Straggler into the PODS (not for lack of hefting, whining, falling, getting scratched, getting chain marks on a bunch of stuff, etc) so that was the bike I left out. 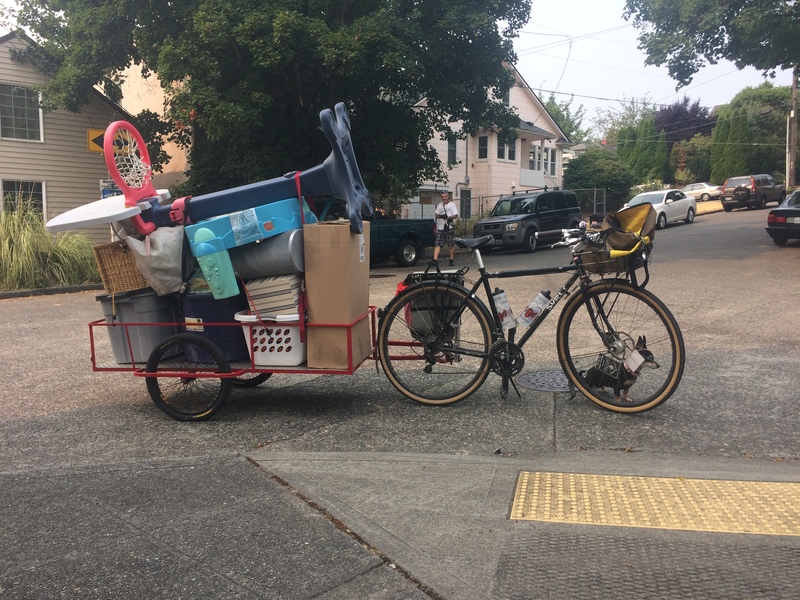 That ended up working to my advantage because after the container left I borrowed a Haulin’ Colin trailer (I have the special hitch on my bike already) so I could make one last thrift store run. And then I took the Straggler down on the train (and the Brompton back up). 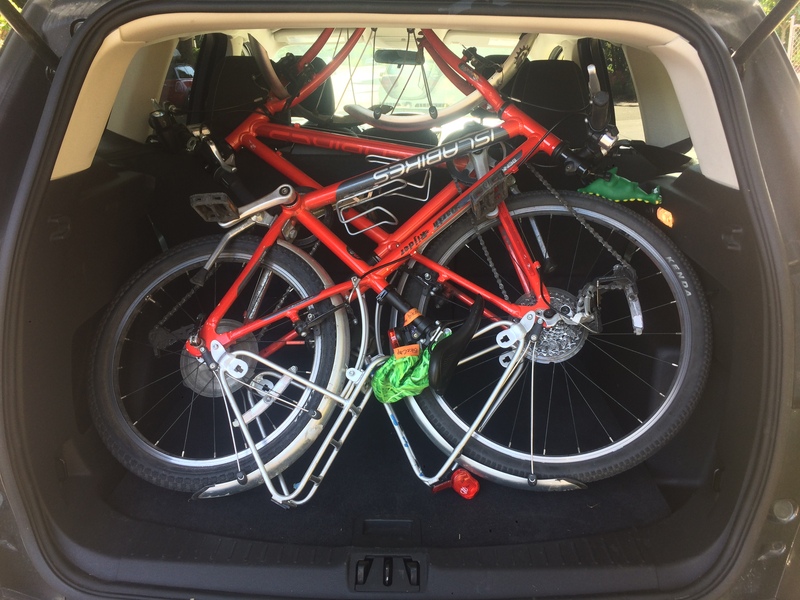 I ended up renting cars twice for visits to Portland to look for housing with the kids (after a couple solo trips that were easy to do by train and bike). The first time we got stuck with an SUV. I always like getting the smallest car possible for better gas mileage and easier parking. Previously I’ve always refused the “For the same price you can upgrade to a larger vehicle!” thing, but this time it was paired with, “Oh, and your small car won’t be ready for a few hours” and that unexpected delay would have put a big wrench in our plans. At least that made it easy to bring bikes along so our weekend wasn’t all spent in the car. After so much driving, I couldn’t stomach one more car trip so we made our final move by train. And surprise, surprise, I somehow still had a lot of stuff to carry. 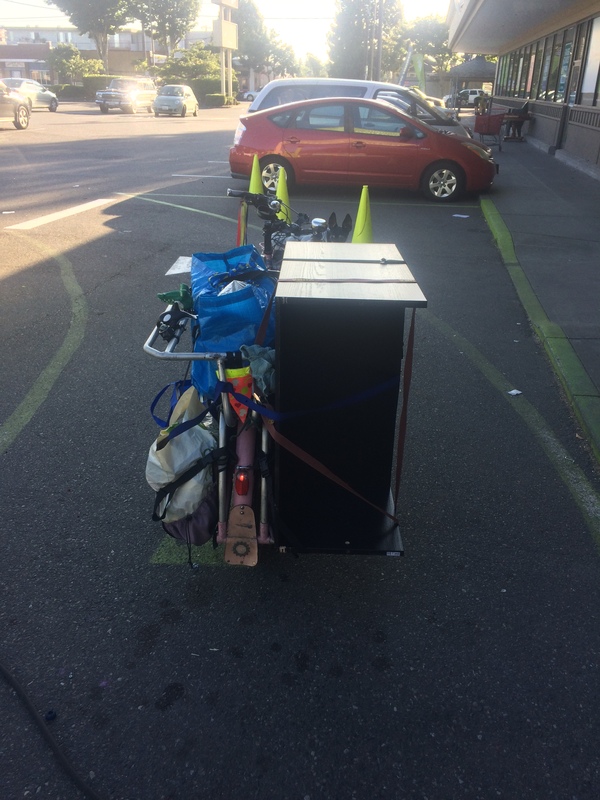 I had the Brompton with me and it played the role of luggage cart marvelously. 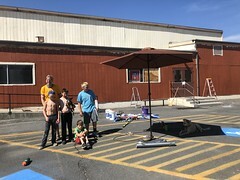 Most notable was when a homeless guy on the last bus leg of our trip (after bus, walk, train, walk, light rail) took one look at me and said, “Wow. I’d been feeling sorry for myself with everything I have to carry, but look at you!” I’m happy to have brightened his day. 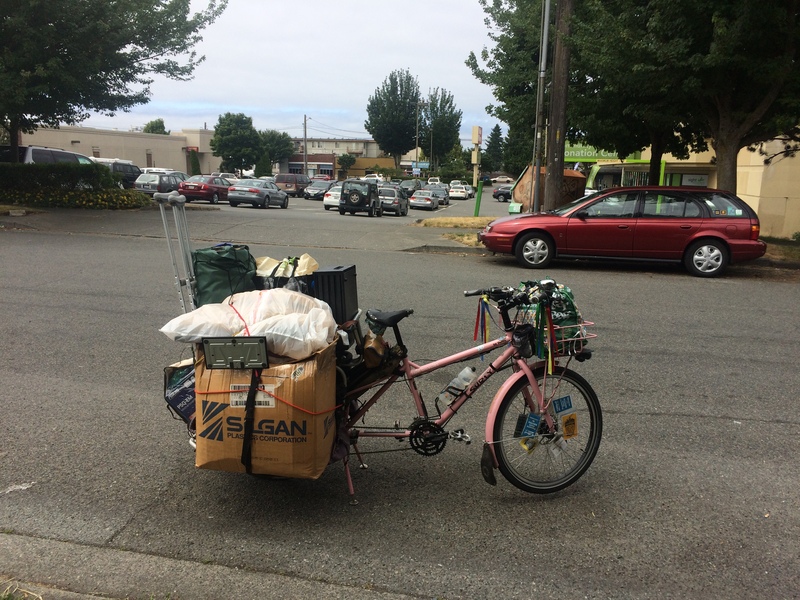 It pains me that I’m sometimes mistaken for being homeless just because I’m on a bike, but I do like that having a bike along (even when it’s not overloaded) often makes me more approachable to homeless people. It’s not the most apparent way bikes unite people, but it is indeed a thing. I’ve left behind some amazing friends in Seattle (whom I hope will all come down to visit!) as well as some great bike events that I’m happy to say will all live on in my absence: Kidical Mass with Familybike Seattle, Seattle Critical Lass, and #coffeeoutsideforher. 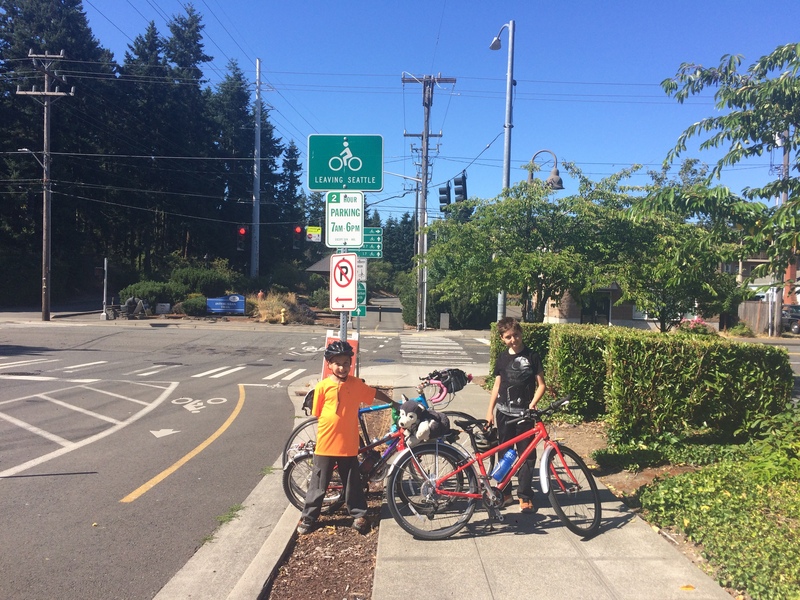 We look forward to visiting Seattle to play bike tourist and see what changes and what stays the same. There are already new protected bike lanes going in downtown! Congrats on the move! Your description gives me flashbacks to that “I’m just about done! …Oh, no, wait there’s somehow a little bit more to move/do” feeling I kept running into. My new theory is that our brains are benignly tricking us into thinking we’re just about done (repeatedly) because otherwise we’d crumble before the truth of what an enormous, borning task moving really is. 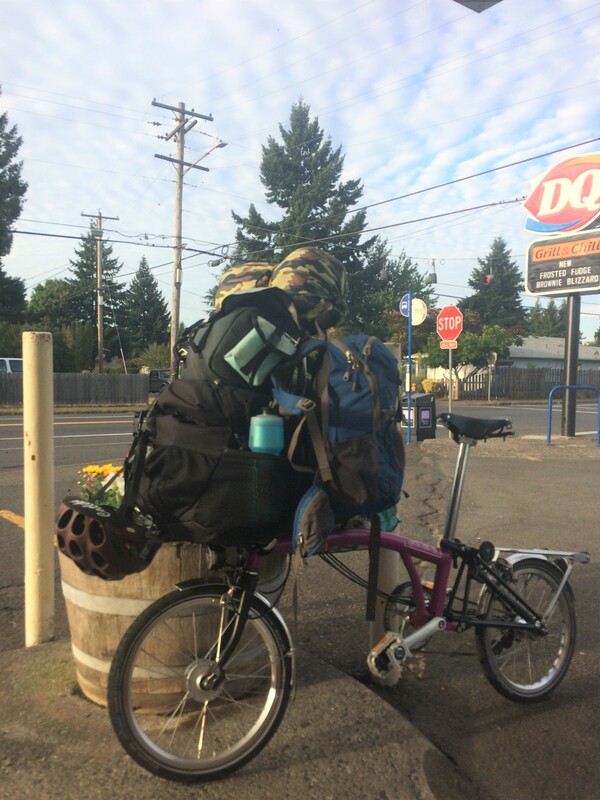 I’ve always loved your blogs and look forward to following your Portland adventures.